Throughout the spring of 2015, students enrolled in the Journalism 575 Community Media class at San Francisco State University worked on a semester-long project in conjunction with El Tecolote titled “Growing up in The Mission.” The class was spearheaded by journalism professor Jon Funabiki, executive director of Renaissance Journalism at SF State. His students conducted interviews and reported on the neighborhood, to find out what it means to grow up in the Mission. For 17-year-old Josh Urrutia of San Francisco, music has been an integral part of growing up. It’s provided a community and a cultural anchor in the rapidly changing Mission District. He’s found this fellowship in the Mission District Young Musicians Program (MDYMP). Here, kids ages 12 to 18 learn music, both from private lessons and as part of a performing ensemble. 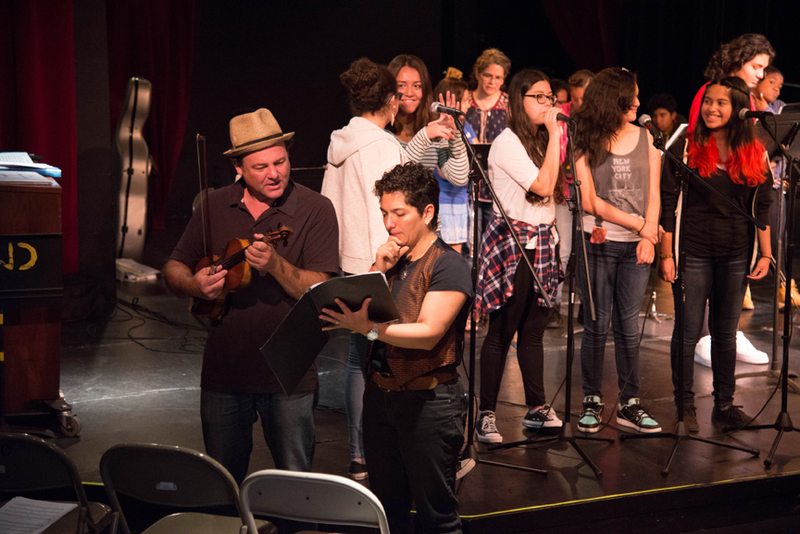 It is just one of the free music programs offered to kids by the San Francisco Community Music Center (CMC). Launched in 2006 with the goal of enriching the lives of low-income youth, the full-scholarship program provides private music lessons and group lessons—90 percent of its students are Latinos. A Mission District resident, Urrutia has been a part of the program for three years and has played viola for about five. He values the connection he shares with the other young musicians. Urritia’s high school, Urban School of San Francisco, also offers various types of music courses for free, but he prefers MDYMP because he feels at home. It’s also a space to celebrate his Latino heritage. The music center is particularly important right now as the neighborhood’s demographics shift. More and more longtime residents—many of them Latino—are being pushed out due to rent increase and evictions. Some of Urritia’s friends from the Mission District were forced to move away to Berkeley and Oakland because of rent increases. Still, the teen isn’t completely bitter about the adjustments. In this transition period, the program offers a cultural anchor for Latino children and their families. Martha Rodriguez-Salazar, coordinator of MDYMP, believes this is one of the main reasons the center is so relevant. Rodriguez-Salazar also noted that the majority of students in MDYMP would be unable to afford music lessons since they come from low-income families. Luis Angel Flores, 15, who plays the violin, said the program has helped him grow as a person and offers a space for kids to learn instead of making trouble on the streets. Flores had been unable to join the music programs at Mission High School. His teachers said the music courses at MDYMP would distract him from his school work, however, the violinist said he prefers MDYMP. Percussionist and guitarist Aminta Guevara, 18, graduated from the program last May, but said practicing music with other youths in the area gave her a time and place to do what she loves for free. Being on a tight budget, she would have been out of luck if the lessons and performances weren’t available, she said. Fruit carts she has frequented over the years have upped their prices for the produce. Guevara considered applying for a job at a trendy shoe store in the Mission, but refrained because she felt the staff looked down on her, which made her uncomfortable. But a place where Guevara does feel extremely welcomed is in the music classes, and like Urrutia, she appreciates the celebration of Latin culture.